The Mill – Long Melford01787 378035work Guest AccommodationThe Mill provides a rather special place to stay in Long Melford; located behind the moat and square pond of Melford Hall! Our two boutique bedrooms boast around 300ft2 of space and are beautifully furnished. They feature off road parking and individual entrances which offer privacy and flexibility so you can come and go with ease. Guests booked in The Garden Room can enjoy their own private garden which is a delight in the summer months. A wood burner is installed for the winter which makes for a very romantic stay. 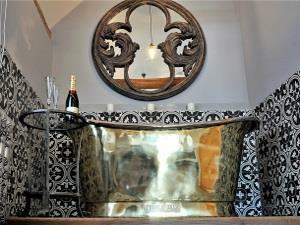 The Melford Room looks north and features a sumptuous freestanding brass and nickel bath as a showpiece. An outdoor seating area offers a lovely little vista toward the soaring spires of Melford Hall. The Mill is tucked away from the hustle and bustle of the busy high street yet its position provides fantastic access to the many pubs and restaurants in the village. Amenities are on the doorstep with the nearest public house and the high street less than two minutes’ walk away. Enjoy a hearty breakfast in the conservatory of the main house, before exploring the village and further afield. To compliment your stay, The Mill offers free use of kayaks and bicycles, so you can navigate the river Stour in Sudbury or explore the many cycle routes around the village. Visit our website for our latest prices, for more information and to book your room. The Mill provides a rather special place to stay in Long Melford; located behind the moat and square pond of Melford Hall!